At a sweet church in Kirkland, WA on a sunny May Saturday, Rodney and Karen, were formally joined in marriage, surrounded by 150+ family and friends. Truth? This was a complicated and time-consuming endeavor. 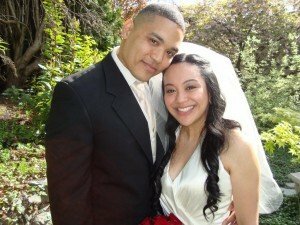 Rodney and Karen desired to have a religious ceremony – one that celebrated their Christian faith and beliefs, and also included cultural rituals and symbols: sharing of coins, the lasso, prayers, candlelighting and much more. Each year, I have the privilege of crafting such an intricate ceremony for a number of couples. There is always a gentle balance between the rituals and the “feeling” of a ceremony. It was important that I captured Rodney and Karen’s heart, sense of humor and pride and tied this into the more serious nature of their shared faith and cultural rituals. Rodney and Karen were beaming as they walked down the church aisle. And I left this couple’s wedding ceremony with a happy feeling knowing all of our effort was hugely appreciated by family and from what I hear, the reception was quite the event!